The name of this watch gives much away about its romantic, dare we even say, poetic roots. Seiko do not usually name their watches. This makes them very difficult to tell your friends about. 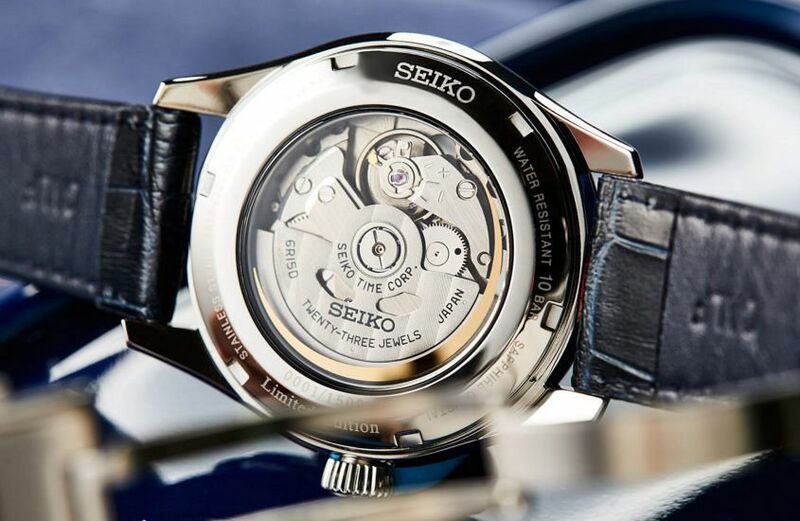 Unless, of course, you have a beautiful mind, and can rattle off Seiko references. Which describes no one in the Time+Tide team. So, long before we saw any images, when we heard the ‘SPB069’ was going to be named the ‘Moonlit Night’ our interest was piqued. It is inspired, the press release says, by the night sky and “Japan’s fascination with the moon”. 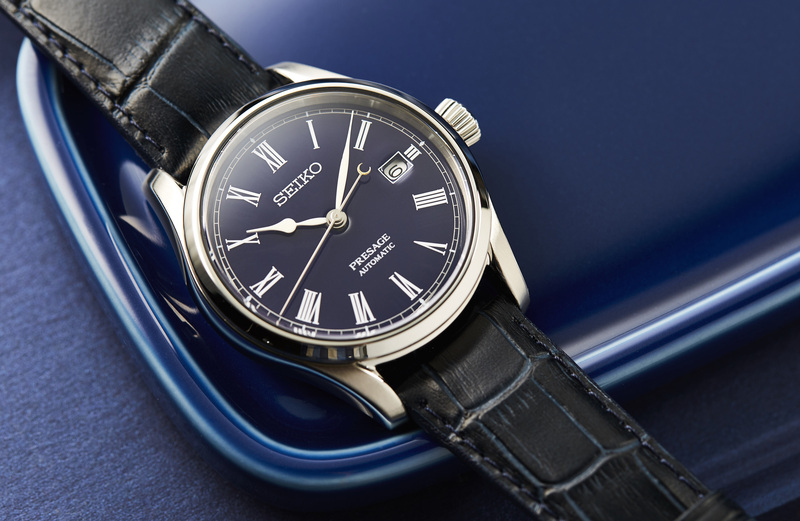 It combines “mechanical watchmaking and Japanese craftsmanship in the form of enamel, expressed for the first time in a rich blue dial”. 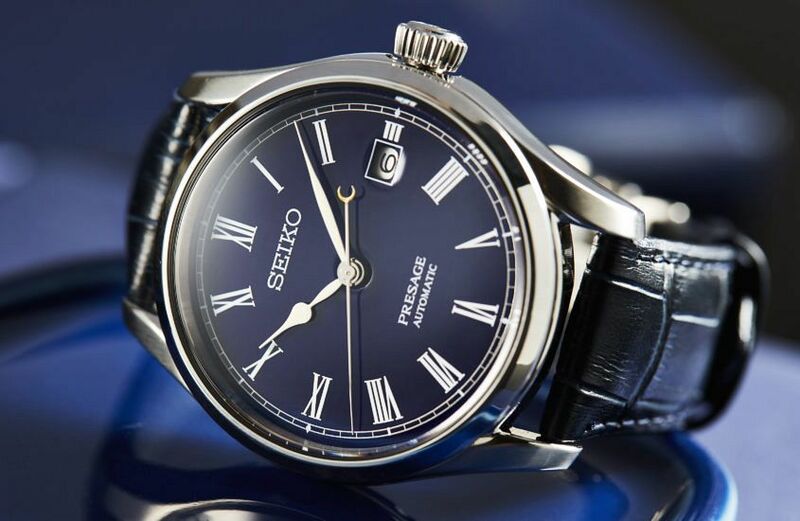 The blue enamel dial is the work of enamel craftsman Mitsuru Yokozawa and his team, who made the white enamel dials that caused us — in colloquial Australian slang — to go completely off ours when we discovered them on other Presage models. Enamel is an exacting art, and blue enamel is particularly difficult as the viscosity is much higher. The skill required to achieve evenness is even more demanding than usual. And due to the small surface area of a watch dial, and how closely the watch wearer is viewing it, the evenness of the enamel is pretty much everything. 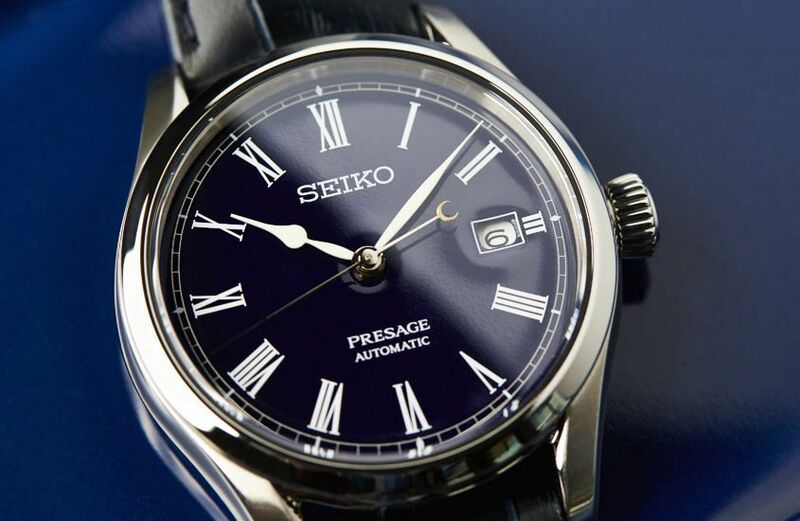 Seiko manage this difficult feat by controlling every stage of the process, going so far as to adjust the composition of the enamel to allow for atmospheric conditions. Like I said, it’s an exacting art. 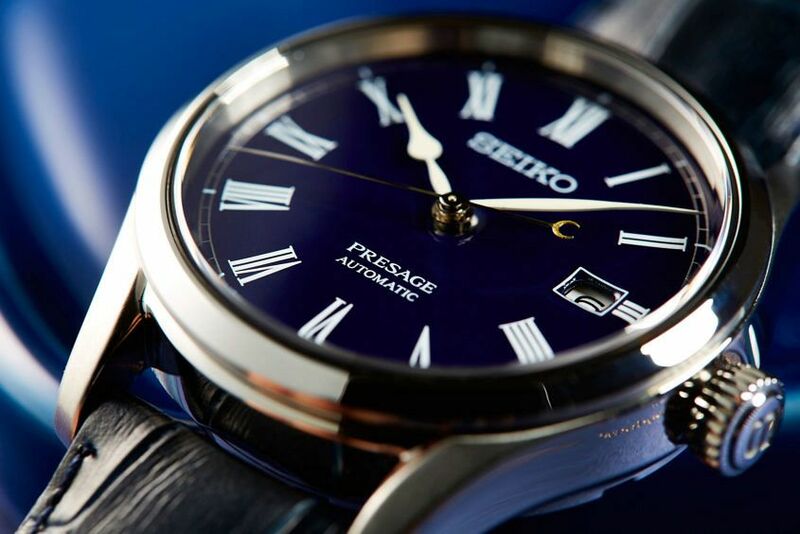 Every single Presage enamel dial is inspected by Yokozawa. 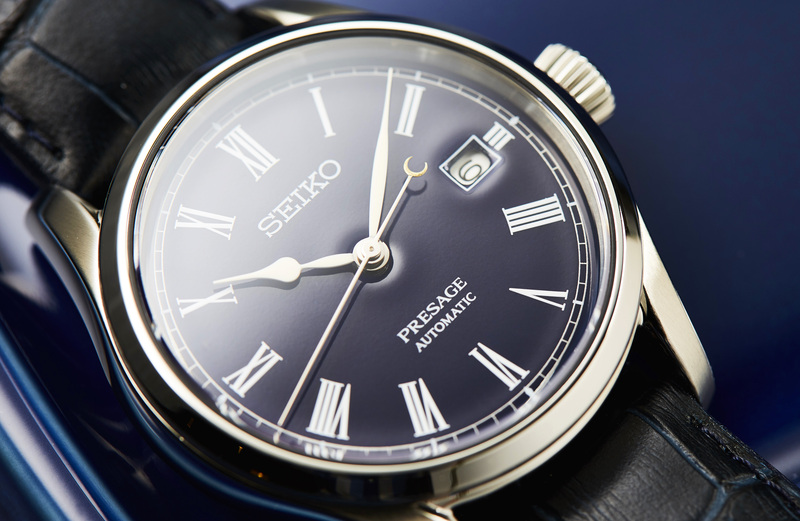 The shape of the hour markers is drawn from Seiko’s first pocket watch, the ‘Time Keeper’, made in 1895. The hands are painted 10 times to lift them in relief from the dial. 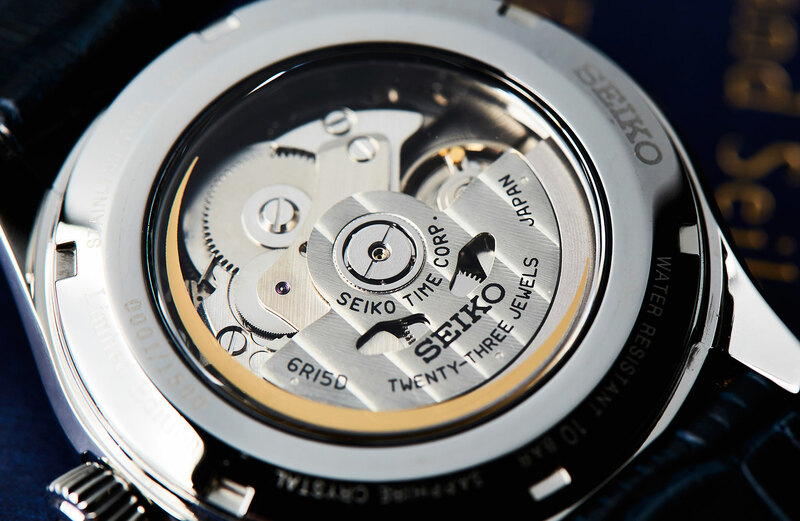 The tips of the hands are curved by Seiko craftspeople so that they follow the contours of the curved crystal to minimise the depth of the watch. The crescent-shaped counterweight on the second hand is coated in a gold colour powder, giving it a similar texture to the moon. 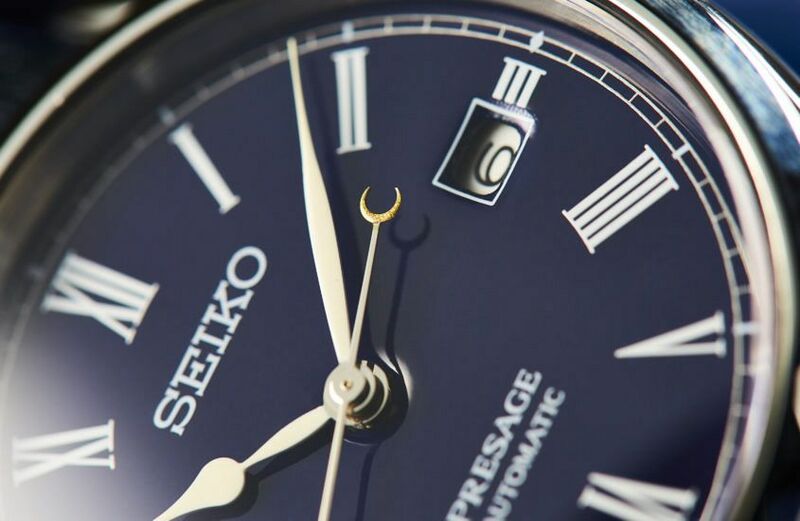 It is intended to move “gracefully across the blue dial, just as the moon moves across the night sky”. The crescent shape carries over to the clear caseback, which is partly encircled by a gold PVD crescent moon. 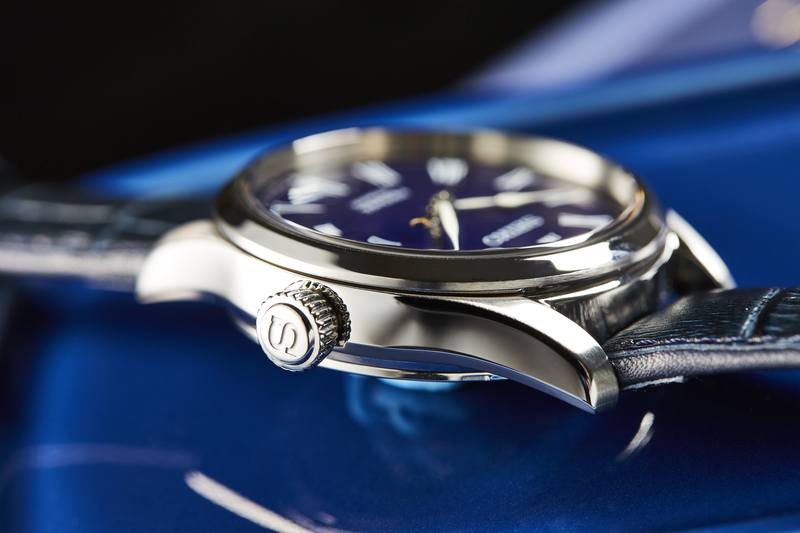 The blue croc strap is colour-matched to the dial and has a delicate sheen that subtly reflects the light.